The new 6-roll machine is designed to straighten high-yield and thick-walled seamless tube and pipe products up to 197mm in diameter. It should be particularly emphasized that the Bronx machine is capable to process both plain and upset pipes due to its advanced technical features. The equipment will be put into production in China by November 2019. “We are very satisfied with Bronx machines, they feature ultimate production rate, longevity and excellent standards of straightening accuracy”, says Cai Fangwei, Deputy General Manager of Tube, Pipe and Bar Business Unit and Director of Equipment & Energy Department, at Baoshan Iron and Steel. In addition, Zhejiang Jiuli Hi-Tech Metals also entrusted Fives to design and supply two Bronx straightening machines for their Huzhou’s facility in the eastern province of China. The company ordered 6-roll and 10-roll machines to process high-yield, seamless, thick-walled, large diameter tubular products. The equipment is designed using utmost technologies to withstand thick-walled stainless tube processing and deliver high level of productivity and excellent standards of straightness. It will be delivered in July 2019 to China for installation and commissioning in Huzhou. “It’s our repeated order for Bronx machines in the 10-year working relations. Fives always stays on the top of their contractual commitments, delivering machines with ultimate production rate, longevity and excellent standards of straightening accuracy”, says Denny Lee (Zhengzhou Li), President of Zhejiang Jiuli Hi-Tech Metals. For both customers 6-roll straighteners ordered, are fully automatic and motorized, utilizing the COMPASS system (COMPuter Aided Setting System) for automatic precision setting of all work rolls. 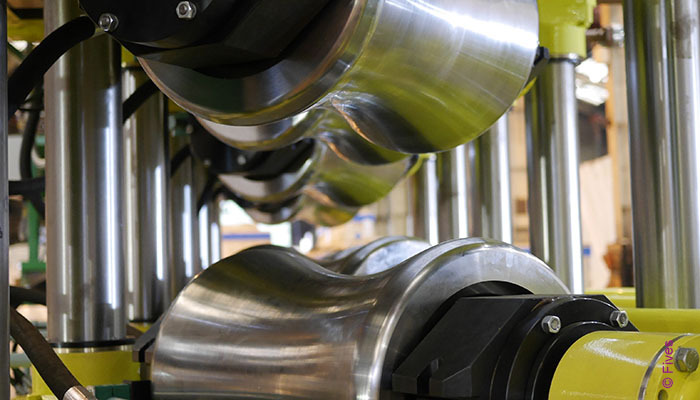 All the equipment is designed and pre-assembled in England, where Fives has been designing and manufacturing Bronx straightening machines for tubular and long products for more than 76 years.